BOISE, Idaho (AP) — Heavy winter snow and a very wet spring in the Western U.S. generated predictions the 2017 wildfire season would be tame. But it’s shaping up to be one of the worst in U.S. history in land burned. Across the region, smoky haze in cities and towns prevented people from going outside except for short periods and prompted potential bans of high school football games. In some areas where homes have burned, people have stayed in makeshift shelters for weeks. Some of the biggest fires this year started in early September, when the wildfire season usually starts winding down. High school soccer games have been canceled this week because of smoky air — and now football stadiums could remain vacant for the biggest games this Friday night. That’s because Idaho air quality is so bad in some places that children and teens must be kept indoors and activities like football and soccer must be avoided, said the state Department of Health and Welfare. Northern Idaho residents are now breathing some of the worst air in the U.S. with an air quality indicator over 460 Thursday morning. A rating above 150 is considered unhealthy and levels above 300 are hazardous, according to the Environmental Protection Agency. The smoky air hasn’t affected Idaho’s important farming sector because most crops have been harvested and the fall planting season has not started yet. But “you look outside and it’s like a thick fog. It’s definitely impacting our sports, football and everything. Practices have been in the gym,” said Kim Johnson, community relations manager at St. Mary’s Hospital in the northern prairie city of Cottonwood. Her sister last year was hospitalized with respiratory failure from wildfire smoke, recovered and “learned her lesson this year,” Johnson said. The hospital itself is serving as a safe haven for people having trouble breathing and who show up to hangout because it has air conditioning and a cafeteria. “We’ve pretty much had people in every day,” Johnson said. Ted Linford doesn’t like to leave the filtered air inside his home for long, but stepped outside Thursday for some bow practice just in case the hazardous air stubbornly clinging to the town of Seeley Lake lifts while there’s still some hunting season left. Seeley Lake, in a valley next to the Bob Marshall Wilderness, usually empties of summer tourists and fills up with hunters at this time of the year. But this year has been anything but normal because of the thick smoke surrounding the area. Air quality hurt by a wildfire burning less than 2 miles (3.2 kilometers) from Seeley Lake got so bad that health officials last month recommended that people sleep elsewhere. Most of the town of 1,600 was evacuated when the fire threatened to spread from the ridge where it was burning. Linford and his wife live just outside the evacuation zone and took in a family a few weeks ago. The fire threat eased this week but the smoke persists. Linford and his wife installed heavy duty filters in their forced-air heating system three weeks ago and the white filters have turned gray. He spends most of the day inside and gets winded if he spends more than a couple of hours outside. “It’s just getting really old,” Linford said. Fires have already scorched an area half the size of the U.S. state of Rhode Island and the smoky haze is even bad in cities with no major wildfires nearby. Pendleton, a small city in eastern Oregon, has had air quality that ranked as unhealthy or hazardous all week even though it is 165 miles (265 kilometers) away from a major fire burning in the state’s famed Columbia Gorge. Images of the city’s downtown in an East Oregonian newspaper on Monday showed clear air and crisp visibility. A photo taken from the same vantage point Tuesday showed so much smoke that the outlines of buildings were barely visible. Pendleton’s residents are suffering from stinging eyes, sore throats, headaches and coughs. Visibility is reduced to three-quarters of a mile (1.2 kilometers) sometimes, said Klaus Hoehna, a regulatory specialist for the city’s environmental programs. People are trying to stay inside and not exert themselves, he said. Another fire in southwest Oregon that ranks among the biggest U.S. blazes forced school officials to delay the start of classes for children a week in the town of Brookings, a small coastal community near the California state line. Helena, once a 19th century mining camp, is on the Trinity River in far northwestern California and is typical of the many small, rural communities throughout the state enduring the severe fire season. More than 30 square miles (78 square kilometers) of forest and 72 homes have burned since August and as many as 15 displaced residents have stayed each night at a Red Cross shelter at the First Baptist Church in nearby Weaverville. “A lot of them don’t have homes anymore,” shelter worker Karen Hammer said Thursday. There has been such a big assistance response that some places taking donations have asked donors to temporarily stop giving, Hammer said. More than 9,500 firefighters were fighting two dozen large California wildfires and authorities warned of potential for more in the far north as thunderstorms produced dry lightning. Relief is finally in sight for Seattle metropolitan area residents who have suffered through days of smoky skies from wildfires. 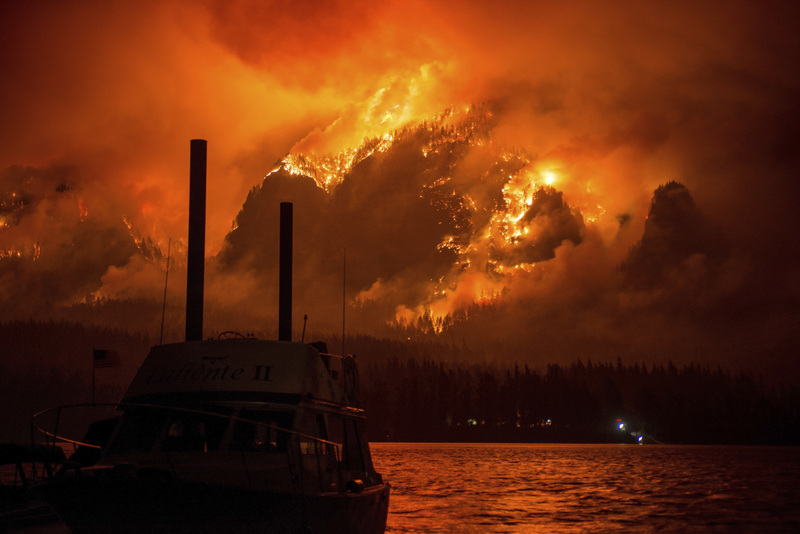 Several large wildfires continue to burn in Washington state, but are not growing much. And the National Weather Service says air conditions should start getting better. “It’s a very gradual process right now,” meteorologist Dustin Guy told The Seattle Times. But eastern Washington state residents will likely have to wait longer for better air. A lightning-caused wildfire east of Mount Rainier National Park stood at 68 square miles (176 square kilometers) on Thursday and was 8 percent contained by 370 firefighters. The fire prompted a closure of the east portion of Mount Rainier for fear flames would cross into the park and threaten hikers. The state’s largest fire is burning in northern wilderness and has crossed the border into Canada. It covers 164 square miles (424 square kilometers). Smoke from wildfires has postponed softball tournament games and a youth mountain bike race in Steamboat Springs. Steamboat Today reported that a 100-mile (160-kilometer) ultramarathon and a mountain bike race for Rocky Mountain Enduro Series are still scheduled for Friday through Sunday. The ski resort and outdoors destination of Steamboat Springs is downwind from two wildfires burning in northwestern Colorado. But smoke and haze from fires burning in the Pacific Northwest that has been carried into Colorado is also shrouding the state. Associated Press writers Gillian Flaccus in Portland, Oregon; Rebecca Boone in Boise, Idaho; Nicholas K. Geranios in Spokane, Washington; John Antczak in Los Angeles; and Matt Volz in Helena, Montana, contributed to this report.